God Calls, Converts, and Commissions! The Islamist fundamentalist group, ISIS, or DAESH, are causing great fear across the world today. They are extreme religious and political terrorists. They most likely see themselves as having some form of prophetic role – the true Muslims who are calling Muslims back to their conservative roots – defending the real, the pure Islam. They want to re-establish the Caliphate, a system of government that harks back to the early days when Islam was in its glory. They also see themselves as an apocalyptic movement, forcing a global confrontation in which they believe Islam will again be victorious. For this, the use of violence is justified, not only against the enemies of Islam, but as a threat to their own people. Back in India in 1999, the callous killing of Graham Staines and his two sons was of the same nature – extreme violence by Hindu fundamentalists towards outsiders perceived to be a threat to Hinduism, and a warning to other Indian Hindus who may have been considering the good news of Jesus Christ. The more recent torturous cruelty meted out to followers of Falun Gong by the Chinese authorities who regard it as a subversive moral threat to Chinese secularism is yet another example of this same dual reasoning – punishment and deterrent. Just last Thursday I was talking with our leading Persian pastor here in Melbourne. We were talking about a particular individual who is going around attending the various fellowships of Iranian believers, posing as a believer, but aggressively asking questions, even quoting Bible verses, trying to show these new disciples of Jesus that following Jesus is wrong. The new believers are afraid of him, and of who may well be behind him – the Iranian authorities who are trying to determine who has insulted Islam by becoming Christian, and implicitly threatening them with the possibility of reprisals. I wonder if Saul, at this stage in his life, at the time of our story today, might be considered in the same vein? A devout Jew determined to protect the orthodox faith of Judaism by stamping out this new aberrant heresy, using violence as both a weapon and a threat, and by so doing, appearing to be what we might understand as a religious terrorist. For me, reading this passage, I don’t think Saul was on a spiritual quest, deeply questioning his existence. I don’t think he was searching for eternal life. I think he believed he was serving Yahweh by doing what he was doing – making Israel safe. And it’s while he is on this particular mission that he’s met by the risen Jesus. I’m not at all surprised that he asks the confused question, “Who are you, Lord?” in response to the voice. To be accused of persecuting the very one who could only be the Almighty, in whose very name he believed he was carrying out this purifying mission? It’s very bewildering! For such a person as Saul, I don’t believe there was any likelihood that he may have been persuaded to believe in Jesus the Messiah through clever theological argument, no chance of changing his mind by convincing new views on the Scriptures now seen through Easter eyes! 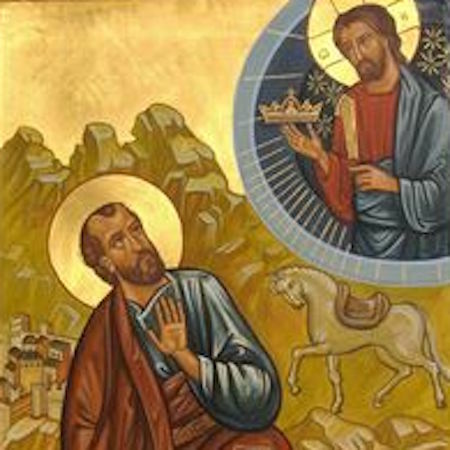 The only way for Saul’s mind to be changed was through encounter – an encounter with the Lord Jesus Christ – risen and alive! But not just Saul. This is what God does with everyone – back then and today. All people’s minds are changed by an encounter with the living Christ, not through our clever and convincing arguments. Conversion doesn’t depend on us and our clever ability to articulate doctrine in sophisticated terms. On the contrary, it is the work of the living Jesus who meets people at times and places of his choosing. Some of these encounters are dramatic, out-of-the-blue experiences like dreams and visions. Others are the result of a quiet working of the Spirit deep within introducing the person to Jesus the risen one. We hear many stories of such encounters from our Iranian brothers and sisters who have been arrested by an encounter with Christ in a dream or a vision. Jesus meets Saul out of the blue. Just like, earlier on in Luke, Jesus met the two disciples walking to Emmaus. They weren’t expecting to meet Jesus either. He was the last person they could have imagined meeting. Or the woman Jesus met on a hot dusty day at a well in Samaria who was not expecting to meet someone she thought could be the Messiah! Or even our gospel reading from John 21 – the disciples in the boat weren’t expecting Jesus to meet them, but how life changed when he did! Ananias, a courageous disciple who clearly had not fled Damascus even though he knew of Saul, would certainly have been surprised by his vision. Although he probably would have thought it more like a nightmare when God sent him to visit Saul – this same Saul that Ananias had heard about! “I want to you to go to Judas’ house – Saul of Tarsus is there and waiting for you.” “What?! You’re kidding aren’t you, Lord?” But Ananias was obedient to the vision, and the commission he was given, blessing Saul with the return of his sight and the gift of the Holy Spirit. And we need to remember the truth that, if God can change the mind of someone like Saul, even when they are not searching for God, then God can change the mind of anyone, even those whom we may think are beyond changing. It seems to me that when we are willing to consider that fact, our attitude to such people is different – our attitude to any person is different. It enables us to enlarge our view of God, and be open to those around us because their life can be the arena of God’s activity. It’s never an easy thing to do, especially when we consider the evil things that people can engage in. And, for our part, like Ananias, we also need to be open to the possibility that God might wish to involve us in some way, and therefore be obedient to the words of the Spirit to us in perhaps facilitating such encounters of others with the living God. We may not have dreams and visions, but the Spirit of Jesus Christ dwells within us, and we need to cultivate an awareness within ourselves that enables us to hear the word of the Spirit, however we may understand it. Perhaps that unbidden thought about someone whom we know, that strange compulsion we feel to call someone, or talk to someone. If we are walking in the presence of Christ throughout each day, these promptings are most likely God calling us to act in the name of Jesus, just like Ananias. The second thing I want to say about this story is that, it seems to me that this encounter was a conversion, a call and a commission all-in-one. You see, in this encounter Saul was not simply invited to change his previous opinions about Jesus or his followers and go on his way. He was confronted, challenged, and consequently, through that encounter, his understanding of God completely turned upside down. From that moment on he was different. Verse 20 says that Saul immediately began preaching about Jesus in the synagogues that Jesus is indeed the Son of God – ironically the very places from which he had planned to launch his attacks against the Jesus heretics. He was called and commissioned, as we also discover, to be God’s instrument to take the good news of Jesus to the outsiders. His life was utterly transformed from what it was prior to that day. And this process hasn’t changed. When we’re met by the living Christ, we’re not invited to simply change our opinions about some things in life, and go on as we have before, but perhaps a nicer version of ourselves. We’re confronted by Jesus Christ, after which life can no longer simply go on as before. In that confrontation, in that encounter, we’re called, we’re changed, we’re transformed from top to bottom, from the inside out. Life can never be the same again. It may not be as visually dramatic as it was with Saul, but it’s no less real, with no less change. And because of that encounter and that change, we regard life, the world, and others round us differently. We’re called to look at life, at ourselves, and at other people through the lens of Jesus Christ, risen and alive. 2 Corinthians 5:16-17. You know, you have your own story of your encounter with the risen Jesus – perhaps dramatic and sudden like that of Saul. Perhaps a quieter but just as powerful sense you were in the presence of God. And because of that encounter, you’re changed – you’re not the same as you were before. And through that encounter, God has called and commissioned you to be his witness, living out the presence of Christ, open to the prompting of God’s spirit, and following where he leads.